Welcome to the Swedish Cruising Association! As an English speaking visitor to the Swedish Cruising Association's website, you unfortunately only have access to the small portion of the website that has been translated into English. The Swedish Cruising Association was founded in 1923 and is a non-profit organisation with approximately 43,000 individually affiliated members. The Cruising Association is for people who love boats, the sea and archipelagos whether under sail or power. The purpose of the association is to promote interest in tourist and long-distance cruising. In modern language, we want to inspire people towards active boating, greater community, and to share experiences to ensure safer boating. We do this by publishing our member magazine På Kryss. Its contents generate inspiration, create community and improve safety through travel reports, articles and factual material. På Kryss is in Swedish and is also available on the web, where quick news items and in-depth articles are published. Our yearbooks have been issued without interruption since 1923 and contain travel reports from members, factual information about boating and destinations. Books from recent years have been about the coast of Gotland, the coast of Norrland, the North Sea and the Mediterranean Sea. The next yearbook is about the Baltic Sea - Saint Petersburg to Flensburg. The yearbooks are only in Swedish. The Swedish Cruising Association is authorised by the Swedish Government to issue international certificates for pleasure boats. Sections organize a number of activities mainly for local residents. A sampling of their efforts includes: training, rallies, lectures, 24 hour field trips and more. Section events are listed under the heading "Aktiviteter" on this website. If you happen to be boating in Swedish waters this summer, you can participate in rallies or 24 hour field trips. The harbour and fairway program is an important part of the Swedish Cruising Association's organization. It consists of a number of sea marks, transit lines, beacons and rock eyebolts as well as more than 160 mooring buoys and 9 harbours. The harbour and fairway committees also produce harbour and fairway descriptions. As a member of the Swedish Cruising Association, you are always welcome to our harbours. If your boat is registered, you also have access to over 160 mooring buoys and The Guest Harbour Guide delivered straight to your letterbox. English speakers can also take advantage of many benefits from joining the Swedish Cruising Association. Swedish Cruising Association members can be found almost everywhere. Wherever you find yourself, along our coast, neighbouring coasts, in the Mediterranean, Caribbean or other ocean, you will find Cruising Association members who can be of help or who you can socialize with. You'll recognize us from our happy smiles but above all from the distinctive compass rose with a lily. If you get caught in a bad deal when buying a boat, have an accident, have to deal with authorities and organizations, it's a good thing to know you have a large organization behind you with resources and contacts. We want safe adventures on the sea.Many of us are experienced and well trained boat people thanks to the opportunities to practice and become better navigators, which is an integral part of the Swedish Cruising Association's activities. 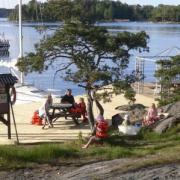 We run sailing schools, sailing camps and organize activities and courses in Sweden. We put buoys out for safe anchoring along the coasts and put transit lines out along tricky passageways. We want to inspire and be inspired. The pleasant moment on the islet rock already starts at home at the kitchen table with the nautical chart, fairway books, natural harbour guides and harbour guides. And especially during the winter, it feels exciting to read the Swedish Cruising Association's magazine På Kryss with its coverage and articles. More than 500 volunteers produce a good amount of useful literature that we as a non-profit organisation can share inexpensively with members through our webshop. We care about our oceans and lakes and do our best so that the next generation has a chance to experience what we have experienced.Our large membership has extensive knowledge about boating which means that authorities and others listen to our advice and views on things before making decisions or drafting legislation. If you want to join us, please click here to become a member. For the first year, you are free to join the local section of your choice. Many association activities take place through your local section. What does a section do? An important part of boating is the social life, local activities and places to meet up. Members of the Swedish Cruising Association have come together in local sections and interest groups that organize such things as training, rallies (including children/youth rallies), 24 hr. field trips, study visits, lectures and meetings with a number of different themes and specializations. Most sections also manage a harbour. The Mediterranean sailors exist to inspire, give advice and guide those who want to reach the Mediterranean on their own keel.